So it is safe to assume that I have a lot of photos to get to, when I can find the time. Ah, time. Where do you go? Anyways, before I start to wax poetic here on the blog, I better get back in focus and talk about this shot. 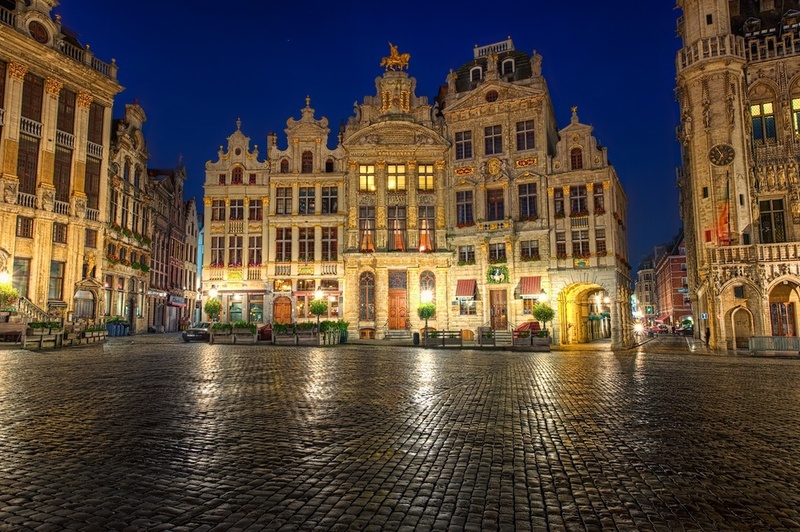 This is Grand Place in Brussels, Belgium which is without a doubt the most beautiful town square in the entire world. I'm not kidding. Clearly I haven't seen them all, but I have seen this one several times and it freakin' dominates. It's a jaw-dropper the first time you walk into the square. When I found out that Brussels was one of my destinations, I was pretty excited because despite it being somewhat small and having a compact historic city center, I find it to be one of my favorite towns in Europe. It's just beautiful. It's helped a little by the fact that they are famous for chocolate and beer, which are two of my favorite things, and both are incredible there. Ok, maybe that helps a lot. But just standing there and looking at this site is something everyone should do. And if you can get up early enough to beat the crowds (and believe me, they are HUGE) then you can get a shot like this one. I think this was about 6:30am and though I saw a couple of people and a street cleaner while there, it was nearly all mine. It was awesome.